Chess is one of the oldest games, from India mixing to Arab cultures. It started from four players and eight pieces to each, to became a mental sport for two people and thirty-two pieces. Don't matter the age or the culture, the chess's aim always has been to protect your pieces against your enemy's army. It can be small magnetic pieces to play in the beach, giant plastic pieces from a hotel's park or porcelain pieces from and old and dusty house. The object it's always the same. Chess's pieces have been changing and adapting to the characteristics and aesthetics of the time. Today you can download an app and play with someone in the other side of the planet without knowing her or his name. 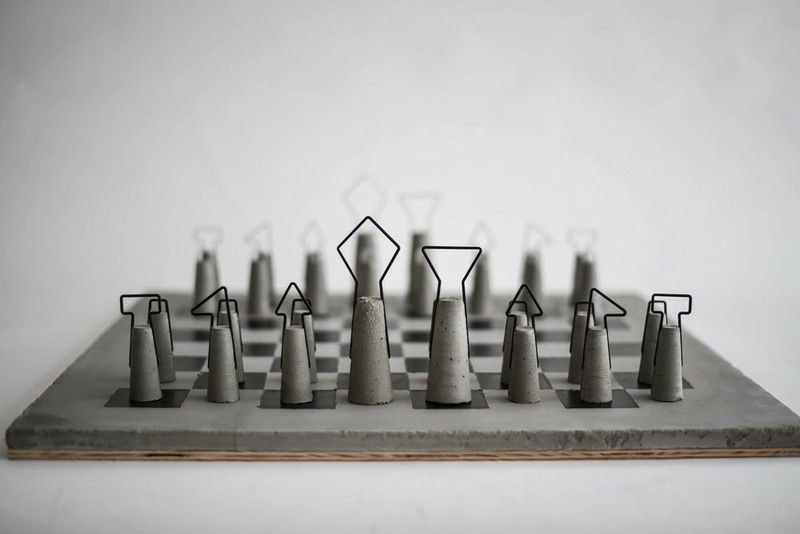 Daniel Skotak take us back to reality with a chess board with imateirals from the industrial era: iron and concrete. Basic material with which you can fight for your color and your territory. Every pieces have the same concrete base for a perfect ergonomics and stability. The difference between the pawn or a bishop it's the top iron piece painted on white or black like the traditional design. The chess board also take us to industrial era with black iron spaces and concrete spaces for the white team. Brutalism as the base of evolution to the digital area to not forget where we come from.